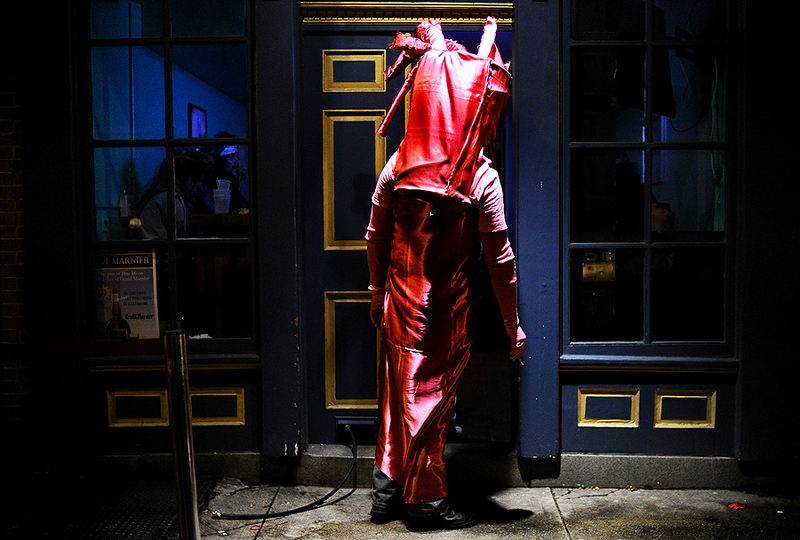 "Mike Burn of Baltimore, Md., takes a break outside a bar as other Halloween revelers navigate between drinking establishments in Fells Point in Baltimore, Md., Saturday Oct. 29, 2011." Was assigned to shoot the debauchery that is Halloween in Baltimore on Saturday night. Luckily the odd October snowstorm and bitter-cold winds didn't stop revelers from doing what they do best when alcohol and costumes are combined. At first, I was worried when I got out of my car at Fells Point. Bar-hoppers were easily outnumbered ninety-nine to one by Baltimore City police officers. But that quickly changed. Why I ended up finding some rather funny, and some, well, unpublishable moments for most publications, I did have a lot of fun braving the cold while searching for moments on this assignment. I tried to shoot the assignment as if I was shooting street photos, but I guess I stand out to those consuming alcohol. I had a lot of moments ruined by the phrase every photographer hates, "Hey, camera dude, take my picture." Nonetheless, I still found some story-telling images, and on my way to my car, I stumbled across this scene. Couldn't resist the colors, textures and light. 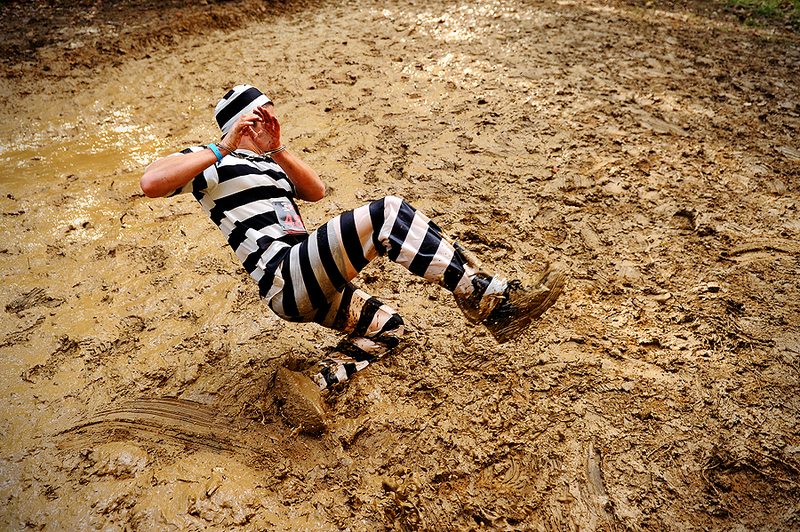 "A hand-cuffed racer slips in the mud as he eludes zombies during the Run For Your Lives 5K in Darlington, Md., Saturday, Oct., 22, 2011." This morning I had the chance to go through my take from the Run For Your Lives 5K in Darlington, Md. I showed a friend some of the pictures since I really wasn't happy with my entire take. He thinks I am crazy that I didn't post more, but we did agree that this picture is more of my style than the last I shared. Despite this not really being a newspaper story-telling image like the previously posted, I do like this image much better. Simply put - it's odd. Maybe if I can be convinced, I'll share more from the race. 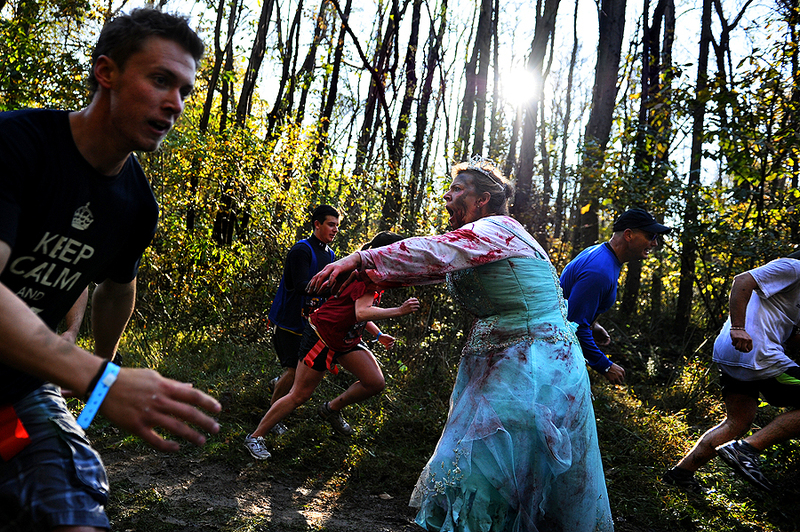 "Zombies try to remove runners flags during the Run For Your Lives 5K in Darlington, Md., Saturday, Oct., 22, 2011." I'm no Sol Neelman, and this was one of the first weird sports I've ever photographed, but had a blast covering the The Run For Your Lives 5K - a running race where racers dodged hoards of zombies along the way. Sol came to Baltimore for the event, so I figured, if he was coming across the country for it, that it must be fun. With that in mind, I asked one of my local media outlets if they'd be interested in photos. Being an awesome client, they already had the assignment in their system and gratefully assigned it to me. Despite getting up before the sun, traffic issues, getting there hours early, and finding quite impossible to track down people for names - it was amazing. I never did get to meet up with Sol since I had another assignment following the race (and was covered in mud head-to-toe and needed a shower in-between), but it was a well executed event. I tried to have as much fun shooting this weird sport as people were racing. I smiled the entire morning, even wished I was racing myself, but had trouble doing my thing. Things were cluttered and the light was pretty bad, especially for sun rise. Maybe I'm over thinking what I shot. It is what it is and had a good morning. Excited to see what the master of weird sports came out with and upset we never got to meet up during the shoot, although we did get to share a beer the night before. 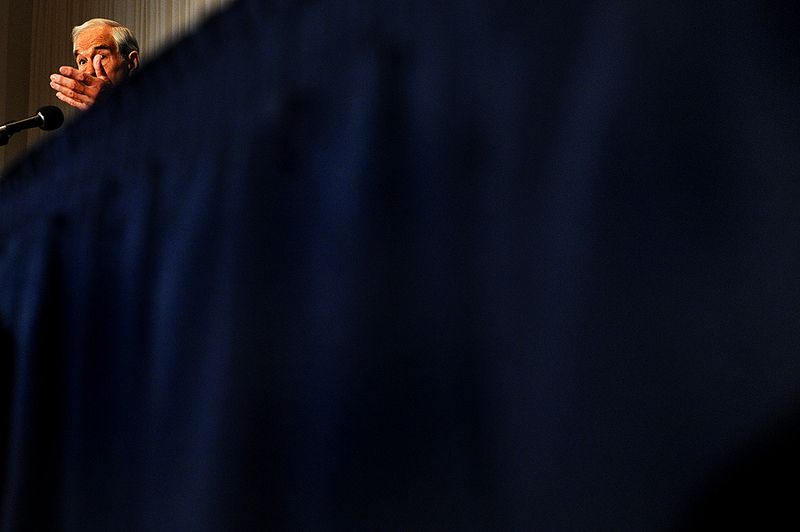 "Republican presidential candidate U.S. Rep. Ron Paul (R-TX) speaks during a luncheon at the National Press Club on October 5, 2011 in Washington, DC. In a new poll, Paul is still lagging far behind frontrunners former Massachusetts Gov. Mitt Romney, businessman Herman Cain and Texas Gov. Rick Perry." Earlier this week, I got a call from asking if I was available to cover some politics in Washington, DC. Without hesitation I said, "Yes" and was making the pilgrimage down south from Baltimore to cover a speech and an event at the White House. I've always been a bit intimated by those covering, as we call it, "The Hill," and the political world around it. Simply stunning work from many different agencies coming out of there every day. The photographers there day in and day out are truly a talented bunch as they make great moments, images of otherwise mundane visual situations. But after being in the district for the day, there seems to be an energy of not just capturing the day, but rather documenting history. While that's always a thought in mind mind during assignments, it's a really captivating feeling in Washington. It's all not hard-hitting news, but the images coming out of Washington every day are important to history around the world. Glad I got a chance to do my part documenting and also meeting some amazing photojournalists that I only knew their names up until this point. 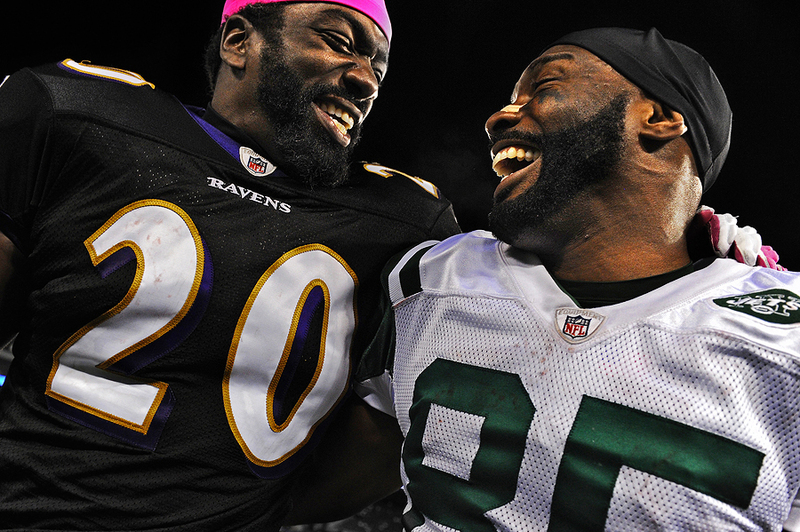 "Former teammates Ed Reed #20 of the Baltimore Ravens and Derrick Mason #85 of the New York Jets share a laugh after an NFL football game at M&T Bank Stadium on October 2, 2011 in Baltimore, Maryland. The Baltimore Ravens won, 34-17." Last night, I covered the Baltimore Ravens taking on the New York Jets in Baltimore. Despite the very late night - I had a great time shooting. I felt as if I was moving more pictures than I was actually shooting, as I attempted to get photos that I thought told the story out before most east coast deadlines. The game was one of the more interesting games I've covered in quite some time, and I don't think I ever shot a two hour first half. Throughout the game, I tried to focus on some of the history between the two teams, including coaches and players who jumped the fence so to speak. I'll be posting more from the game, but liked this moment between former teammates, that was sent long after editors, designers and copy desks around the country went to bed. "Michael Oher, offensive tackle for the Baltimore Ravens, is photographed at McDonough School on Sept. 30, 2011, in Baltimore, Maryland." 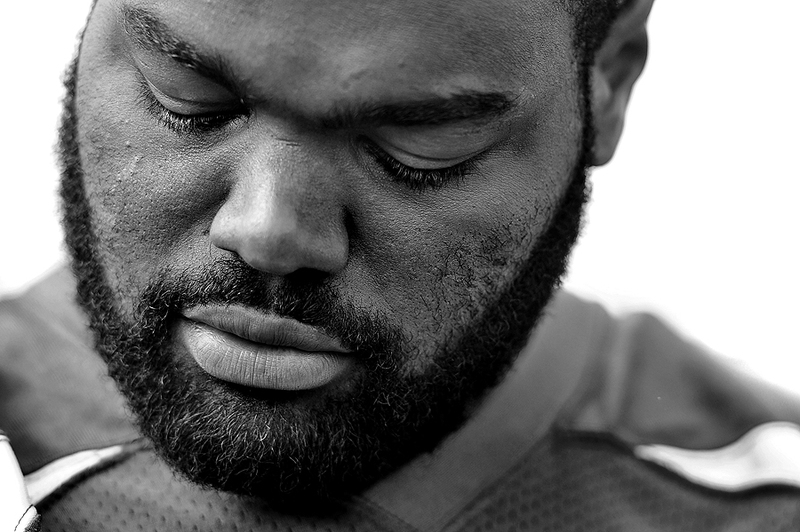 Teamed up with Brian to shoot some pictures of Baltimore Ravens offensive tackle Michael Oher yesterday. Things went very smooth and Oher is a friendly, laid back guy who was patient and open for anything we needed to shoot to make our client happy. While we lit almost everything in a dramatic way, I liked the in between moments the best. Most are used to seeing and thinking that football players are big, mean and intimidating. And while I tend to see that aggressive side of NFL players on the field when photographing the games, I liked this quite moment from the shoot because of that preconceived notion. It's nice to know that these superstar, phenomenal athletes are human and have genuine quiet moments that we often don't get to see from the sidelines or stands. Thanks again, Oher. Good luck the rest of the season.